A leading hardware and electronic manufacturer, ACER updates its new Aspire Notebook range with the convertible Aspire R 15, that featuring 6th Generation Intel Core processors, up to 12 GB DDR4 memory with faster speed and , up to NVIDIA GeForce 940MX graphics, lower power consumption and a reversible USB 3.1 Type-C port makes the transmission speeds of up to 5 gigabits per second. Acer Aspire R 15 is the thinnest 15-inch 360-degree convertible which can lay perfectly flat at 180-degrees with patented soft-closing hinge allows elegant transformation between 4 modes. 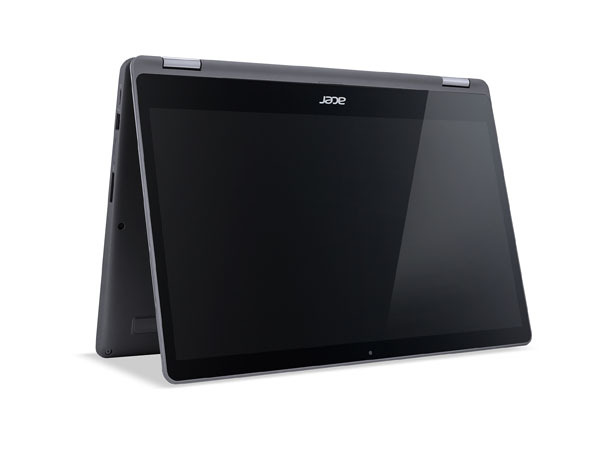 The convertible notebook comes with Acer ExoAmp Antenna technology that improve connectivity and give stable wireless experience. The Aspire R 15 is a convertible notebook which comes with a metal top cover with a hairline-brushed finish, the bottom cover is made of 40% glass fiber and silver particles. The convertible notebook runs on Windows 10 OS with Cortana, Skype etc pre-installed. It offers battery life of up to 9 hours. It measures just 14.4mm in thickness. The Aspire R 15 comes with Acer TrueHarmony and Dolby Audio providing an immersive experience while the automatically reversing audio channels according to the orientation and mode of the device. The company also updated its Aspire F 15, Aspire E 14, Aspire E 15, and Aspire E 17 consumer notebooks in terms of processor support, new colors, and build. The Acer Aspire R 15 will be available in North America in May with prices starting at $699.